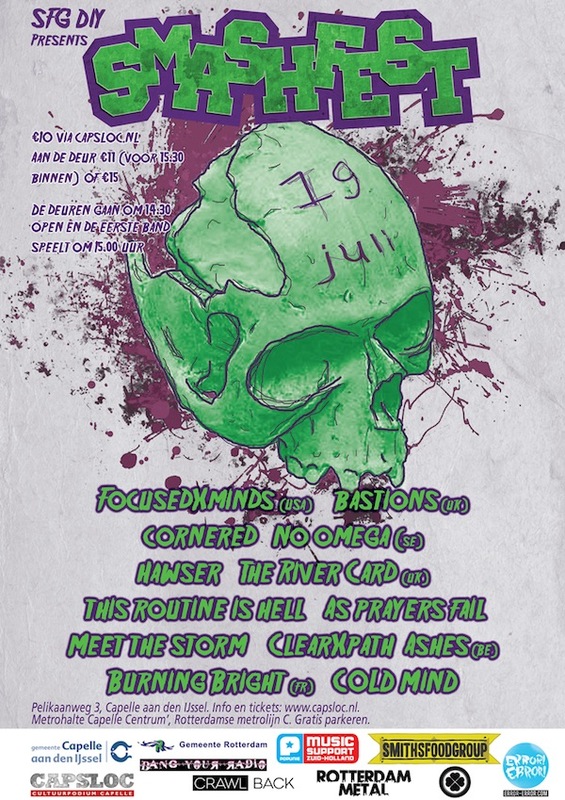 On July 19th, hell’s gonna break loose in the small rivertown Capelle aan den IJssel in The Netherlands. Focused Minds, Bastions, Cornered, No Omega and HAWSER will be shredding the stage, just to name a few. We have the privilege to give away 2×2 tickets for this fest. All you have to do is head down to our Facebook-page, find the below poster and tag yourself in it (it might help if you like and share it as well). Make sure to stay updated through their Facebook-event and attend! Tags: Bastions, Capelle aan den IJssel, Capsloc, Contest, Cornered, Focused Minds, Hawser, Kaarten, Smashfest, Tickets, Win, Winnen. Bookmark the permalink.